The majority of water in the UK comes from groundwater sources. Rain water permeates layers of soil, clay, sand and rock and in the process picksup a number of minerals along they way. Hardness is defined by the content of calcium and magnesium that is found in water. The harder the water the more calcium and magnesium it contains. Although it is not toxic, hardness can cause a number of problems. If your kettle looks like this then each time you make a cup of tea it will cost you an extra few pence for your electricity as the heat has to penetrate the limescale. There is a good chance that your water tank and its immersion heater will probably look like this inside. And it takes considerably more energy to heat this giant kettle. 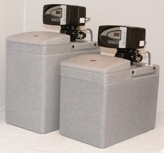 The answer is simple – fit a water softener. We guess the next question is How much does it cost? The costs depend largely on the softener you choose, there are a variety available to pick from and our free site survey service will be able to establish your needs and give you a quote on the best solution. The good news is that over the next few years you will get that money back as you will not use so many cleaning products, washing powder, shampoo, shower gel, gas & electricity. In addition the life of your water appliances will increase so you won’t be replacing the boiler or kettle so often. Even better news for whoever cleans the bathroom, sink and toilet – you won’t be spending so much time and elbow grease doing it. Same applies if you clean your own car – the ‘chamois’ leather will work quicker. There are also health benefits, as those who suffer from eczema and psoriasis have seen & felt reduced inflammation. Water softeners are not just for domestic use, we can also recommend and supply a range of larger industrial units for all your water softening needs within the commercial environment. 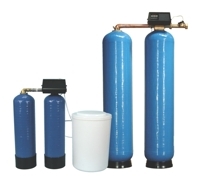 As independent distributors for a range of water softener manufacturers we are able to offer you the most suitable cost effective option for your domestic or commercial needs. If you would like any more information please contact us on 01932 852 423 or email sales@kkwater.com.